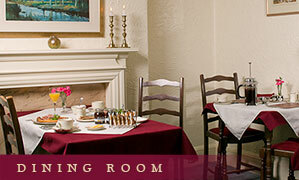 Breakfast is personally served in the comfortable ground floor dining room, with a choice of juices, cereals, toast and preserves. 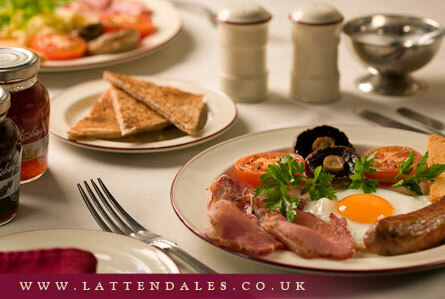 Our English breakfast, all locally sourced, offers a choice of award winning Cumberland sausage, smoked bacon, free range eggs, with grilled tomatoes, sautéed mushrooms and crispy fried bread. The vegetarian breakfast includes sausages (Linda McCartney) free range eggs, grilled tomatoes, sautéed mushrooms, hash browns and baked beans. For the lighter appetite, why not try our own home made organic muesli with a choice of fresh fruit and yoghurt followed by hot toast, blossom honey and preserves? A plentiful supply of freshly brewed ground coffee is available, together with a selection of breakfast teas and fruit infusions. With a little notice we will do our best to cater for any special dietary requirements.